Enjoy a safer, sudsier wash with the McKee's 37! The McKee's 37 Half Gallon Foamaster Foam Gun Combo provides you with everything you need for super safe, super sudsy car washes with nothing more than your garden hose! This perfect combination of a reliable foam gun and incredibly rich and foamy car wash formula puts an end to swirl-inducing hand car washes. By blanketing your vehicle in foam, you loosen even the toughest dirt and grime so that you can safely rinse it away with little to no agitation necessary. 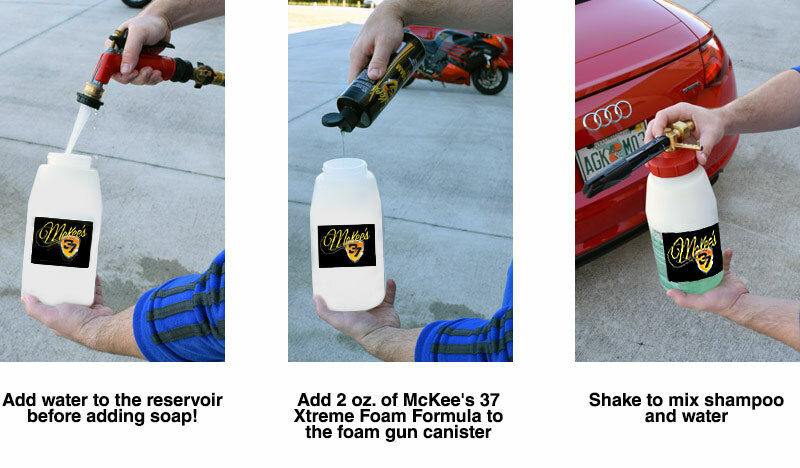 The McKee's 37 Half Gallon Foamaster Foam Gun Combo makes washing your car easier and safer! McKee's 37 Xtreme Foam Formula, 128 oz. A total retail value of $137.98. Save $22.98!